The first iteration of an ongoing transnationally roving amphitheatre, as part of A Utopian Stage, artists, performers and filmmakers were inclusively incorporated within a collective arena of experimentation echoing the progressive pitch of the Festival of Arts, Shiraz-Persepolis (1967-77), and the highs and lows of universalist utopian ideals. Amidst resurgent forces of cultural and political reactionism around the world, below the levels… proclaimed a radical site of collective exchange. 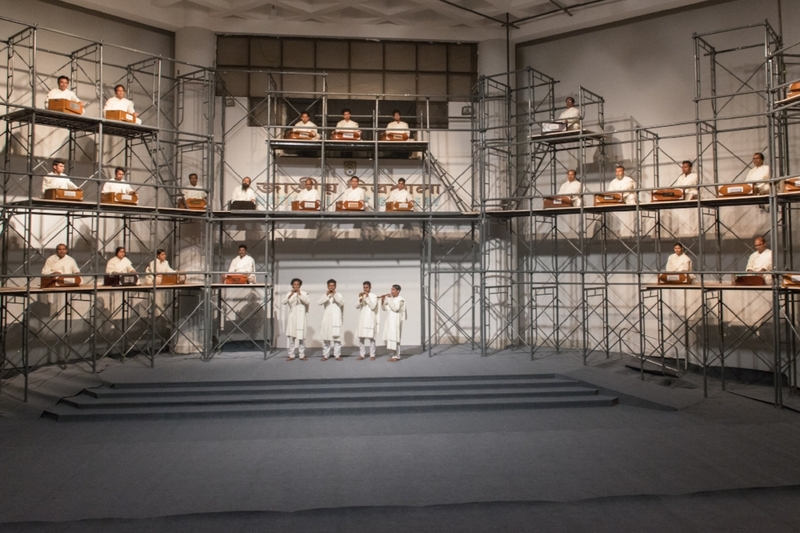 During the Dhaka Art Summit 2018, below the levels… drew upon the music, theatre, dance and politics that informed the utopian aspirations and contradictions of the original festival, with contributions by Hassan Khan, Goshka Macuga with Vali Mahlouji, Silas Riener (Merce Cunningham Trust), Reetu Sattar, Yasmin Jahan Nupur with Santal performers and Lalon Baul singers. An inaugural performative collaboration in which a procession of known characters from the Festival of Arts, Shiraz – Persepolis protested and occupied. What is it that is so comforting about the narrator’s voice? And is conflict always predicated on some sort of agreement? What does the hammer strike when it does? And why do I hate this word yet choose to speak of it? How do we encapsulate time via our shared past? This performance engaged visitors with the sound people grew up within South Asia, simultaneously recognising the receding path into so-called ‘modernity.’ This project was co-commissioned by the Samdani Art Foundation and Liverpool Biennial, in association with Archaeology of the Final Decade and the New North and South. Silas Riener engaged with the local audience and leading them through Merce Cunningham’s Field Dances workshop, culminating in a site-specific performance. Inspired by children’s carefree, unstructured play, Field Dances was first performed in 1963 to music by John Cage with costumes designed by Robert Rauschenberg. Collaborating with the Indigenous Santal people and Lalon Baul singers, Yasmin Jahan Nupur’s performative dance and video series broke down language barriers through a process of body movements and participatory dances, telling stories about life, spirituality, and culture, to create a bridge between city and local dialects, cultures and lost languages.